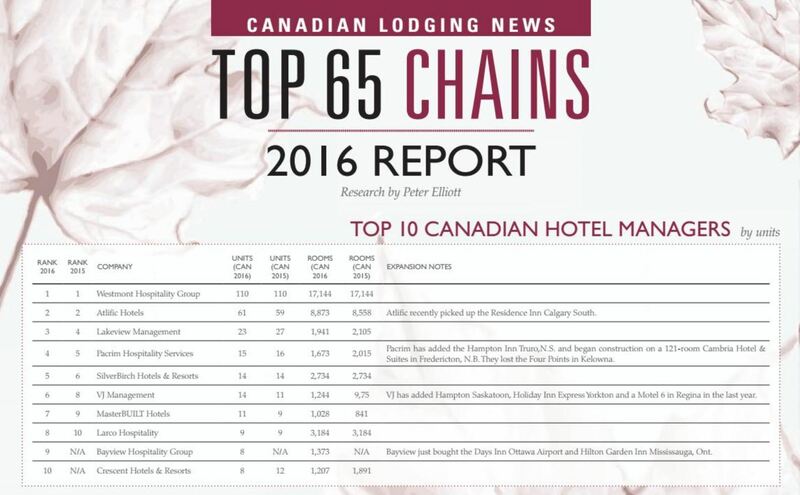 In the News - VJ Management Inc.
Canadian Lodging News recently listed VJ Management as one of the top ten Canadian hotel managers in their 2016 Report. Although the company has been known primarily for its work in the hospitality sector, VJ Management has started to make a name for itself with some enticing residential properties in the Saskatoon, Saskatchewan, area. According to the company’s principals, two of its most recent developments are drawing a lot of early interest because they follow the old real estate axiom that the three most important things are location, location and location. Based in Saskatoon, VJ Management has a wealth of experience in the hospitality sector, owning and operating hotels throughout Saskatchewan in the province’s major cities including Saskatoon, Regina, Moose Jaw, Prince Albert, Swift Current and Lloydminster. According to the company, principals Roger Egger and Shaun Ng have more than 70 years of experience in the hospitality management business combined, and have been involved in a string of successful hotel projects across western Canada. However, the company is making its entrance into the residential arena in a big way with a pair of multifamily town house developments located on some prime neighborhoods in Saskatoon. The Parkside Villa and Saratoga Condominiums projects represent a big step forward for VJ Management, and Ng says the company hopes they will be the beginning of a comfortable new niche for the developer in Western Canada. Located on the western edge of the city, the Parkside Villa development promises to give homebuyers the space they need in the neighborhood they want. Project Manager Rob Chan says the development is very close to parks, shopping, mass transit, recreational facilities and high-quality schools. The development’s central location and surrounding neighborhood make it an ideal spot for young families, Chan adds. “The Parkside Villa project is going to appeal to certain middle-income people because that’s the kind of neighborhood that it’s in,” he says. Within the Parkside Villa’s town houses, residents will discover a full suite of amenities on par with many of the best developments in the neighborhood, Chan says. The average floor plan measures about 1,200 square feet and features two-and-a-half bathrooms, one of which is connected to the master bedroom. The master bedroom also features a walk-in closet. On the ground floor, residents will enjoy 9-foot ceilings and an attached garage with direct entry and automatic door opener. Each town house features a fully-appointed kitchen with appliances, oak cabinets, ceramic backsplashes and a built-in island counter with seating. The development also features a number of energy-efficient components, including Energy Star-rated windows, doors and furnaces. VJ Management is taking the same approach on the other side of the city with its Saratoga Condominiums project. Like its sister development on the west side of Saskatoon, the Saratoga Condominiums development benefits from a highly desirable location with easy access to recreation and essentials, according to Chan. The development’s common area features an underground parkade that includes easy elevator access for residents, a heated underground car washing bay and bicycle storage area. Residents also will have access to a fully equipped fitness center with a weight room, as well as a combination meeting and games room. Inside each condo unit, residents will find engineered hardwood flooring, 9-foot ceilings and individual central air conditioning units. The condominium’s kitchens feature quartz countertops, tiled backsplashes and stainless steel, Energy Star-rated appliances. The condos also include double-glazed, low-e windows and low-flush toilets to help improve the development’s environmental footprint even further. The development’s underground parkade is perhaps the most unique feature of the Saratoga Condominiums, and Chan says it has been the most challenging aspect of the construction so far. Starting the foundation work during the winter was difficult, he says, but VJ Management’s experience in the hospitality sector and with construction management has helped it keep the project on track for its anticipated completion date in June 2015. According to Ng, VJ Management feels confident in its residential developments because the city of Saskatoon has been experiencing a growth spurt in recent years. With an influx of young families coming into the market, VJ Management understands that there will be a huge demand for housing aimed specifically at the first-time homebuyer. By providing this group of new homebuyers with housing that is of good quality for a good value, Ng explains, VJ Management expects to carve out a nice spot in the marketplace for itself. See the article on the B & C website here.